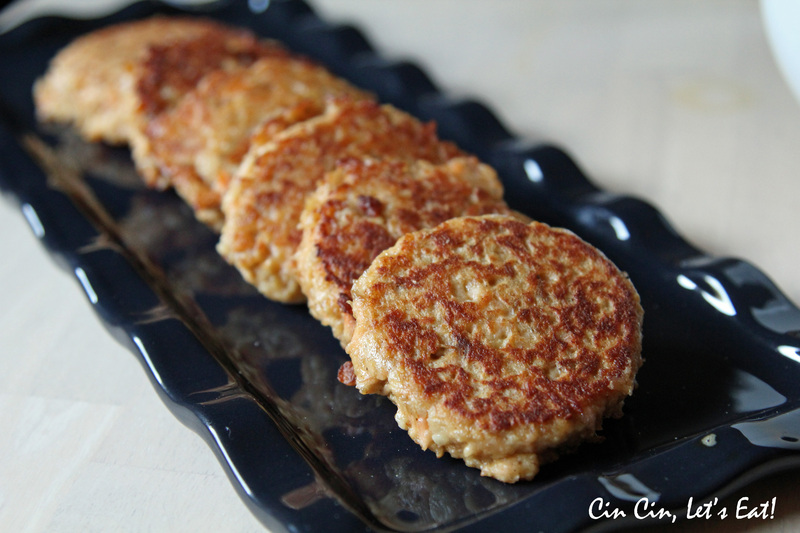 Asian Style Salmon Cakes [recipe] – Cin Cin, Let's Eat! A great way to use up certain leftovers is to make them into little patties or cakes. For example, leftover BBQ corn, slice kernels off the corn, mix with pancake batter, pretty darn good eaten savory or sweet with maple syrup. Leftover mashed potatoes, add a few more ingredients and herbs such as bacon or bell pepper, bind with egg or breadcrumbs, pan-fried them crispy. When I had some cooked salmon filet leftover from last night, I did the same thing, made them into delicious patties. These little cakes can be enjoyed several ways. I like to eat them with hot rice, with a simple drizzle of soy sauce and a squirt of lemon juice. They are also delicious topped with sauces like nutty miso, creamy goma (sesame), or tangy tonkatsu, and wrapped with lettuce. And what seafood cakes don’t go well with tartar sauce? A few things I did different, I added ~1 tbsp of ponzu sauce (citrus-based sauce) and a splash of soy sauce instead of salt. Pre-heat your skillet over a medium-low flame. Combine the salmon, eggs, scallions, celery, vinegar, lemon juice, ginger, ponzu, soy sauce and pepper well. Add a small amount of oil to the warm skillet and cook your patties for 4-5 minutes on each side. Do this gently and take your time. You want the ingredients to cook together without the patty getting too dark. What a delicious recipe – I love it. I always have some salmon left over and this sounds great. Yum! I’ll bet this would work great with the TJ’s “just salmon” that they sell–one less step for me! This is dinner inspiration for sure. Looks delicious, did you use farmed or wild?